We offer personalized sets of soy candles in vintage mugs and punch glasses for your favorite gals. You choose the scent and color. Click here to get a set. We'll help make your wedding tables look magical and unique with personalized soy candles in vintage mugs and punch glasses. These pieces would look lovely on tables with a rustic, eclectic, or shabby chic style. 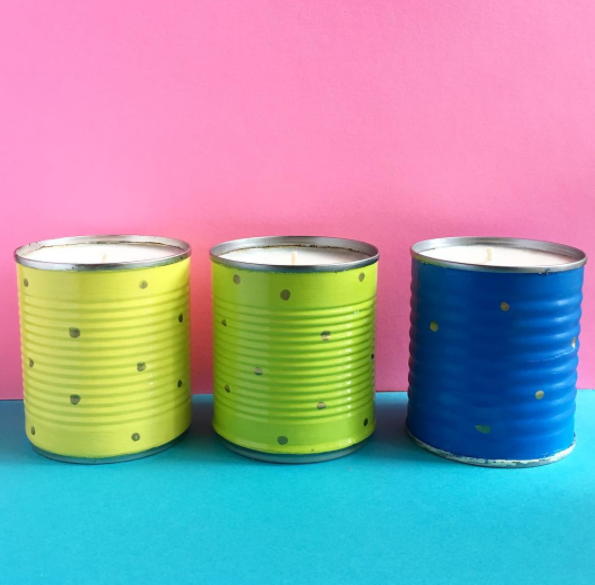 Send your guests home with a memorable wedding keepsake of personalized soy candles in mini canning jars or mini cans painted in your colors. You choose the color and scent to coordinate with your wedding colors, and we'll outfit them with personalized tags featuring your initials and wedding date. We love to provide the special touches that make your wedding uniquely you with handmade soy candles in vintage glassware and reused cans. We scout out thrift stores and antique sales to find one-of-a-kind pieces, and transform them into charming soy candles. Working with you every step of the way, we select vintage teacups, punch glasses, mason jars, and other pieces that perfectly represent your unique personality on your big day. Below are some of our wedding candle options, and we are completely open to your ideas. Contact Jess at info@miltonandmargies.com for more information or to place an order.